This room filled with purplish and pinky tones is a real mash of interior ideas and colours and somehow even though there are some what clashing colours, it works. 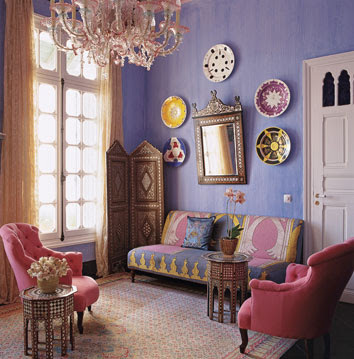 I like the pink arm chairs and the chandelier hanging on the walls the best. Definitely a room that will make inspire creativity.